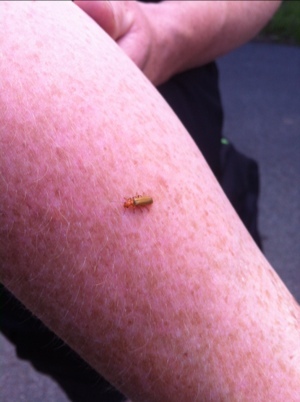 On this morning’s run I was joined by Ginge who in turn was joined by his own training partner/stowaway – this little creature. 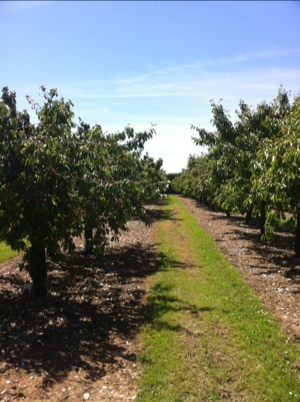 It was supposed to be a bit grey and overcast, but as we ran it was all blue skies and heating up nicely. 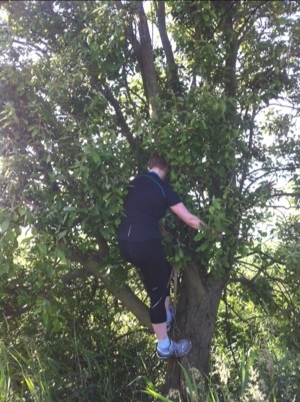 We did a two mile jig along the lanes, stopping to climb a tree en route. I had to have Ginge with me for this one not only to take the photo, but also for his tree climbing knowledge . I am largely unskilled in the ways of tree climbing due to me (a) having pathetically weak upper body strength (b) having an unnerving ability to fall off things and (c) having an ongoing fear of being shouted at. Anyway, this is me ascending a tree. I didn’t fall out, but I did graze my leg. We’ve also crossed off a couple of non-running treasure sports. 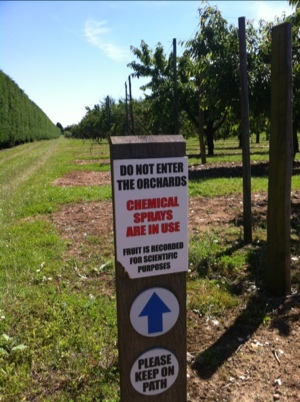 Firstly a trip to a Kentish Orchard at Brogdale. I did a Juneathon gesture of a flipflop shod sprint and would have done a tree trunk push up, but you’re not allowed near the trees because they’re monitored for scientific purposes. We did buy some cherries and some apple juice though. I am most impressed – not only running but now cross training too is this a new category or do you get extra points for this? haa! very good! 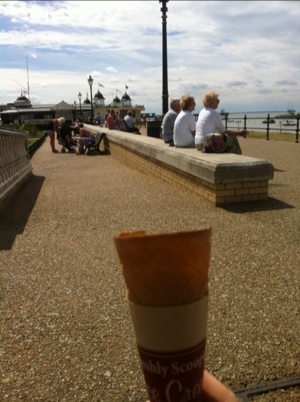 and incidentally: http://morningofmagicians.wordpress.com/2012/06/25/whitstable/ – you should have come yesterday!